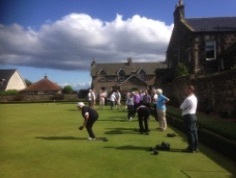 On Saturday 4 July, Burntisland Bowling Club held its bi-annual fund-raising event in aid of Cancer Research UK. Participants were allocated to 12 teams of triples to take part in a three-part challenge. 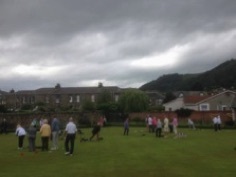 The event, which started in dull, cloudy conditions, began with the teams negotiating a 'crazy bowls' course. Then, after a break for refreshments, their general knowledge was tested in a quiz covering Scotland, Sport and Entertainment. The day ended in glorious sunshine with a series of conventional bowls matches in a round-robin progressive competition. The winning team on the day was led by Alan Lascelles with Mary Hindle and Ian Jamieson. More importantly, a thoroughly enjoyable day raised over £457 for Cancer Research UK. 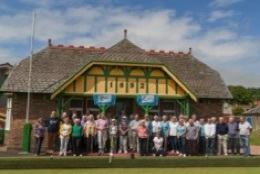 A feature of the Club’s community involvement over several years has been the introduction of Burntisland Primary School P7 pupils to the game of bowls. Each season, parties of 10 pupils from the school are introduced to bowls and are shown the basic features of the game.